NOTE: This content is old - Published: Thursday, Sep 6th, 2018. The failings which led to the closure of a local nursery came under fire yesterday, with the leader of the council warning that the local authority cannot bid for grants for facilities when there is no revenue to run them in the future. Cllr Mark Pritchard issued the message during a debate on the closure of Sprouts in Rhosddu – a part council and part Welsh Government funded nursery, which was closed last September due to no longer being financially viable. 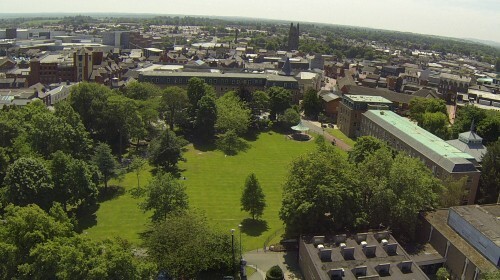 The project itself had largely been funded by a share of a £10 million Vibrant and Viable Places grant, which was awarded to Wrexham Council to help fund nine projects back in 2013. The closure of the nursery had been brought to the employment, business and investment scrutiny committee by Cllr Marc Jones, who submitted a topic-request form for more information behind the nursery’s sudden closure. A report presented to councillors yesterday highlighted that ‘lessons needed to be learned’ from Sprouts, including several contributing factors which could have stopped the closure of the nursery, and was likely the closing chapter on the matter. Such factors include the uptake in the extended opening hours being less than projected, issues with the original business plan and the council not utilising expertise within its own departments. Cllr Phil Wynn, lead member for education, said that he believed officers had acted in good faith and that Sprouts had proved to be the wrong decision. He continued: “With Sprouts I have to acknowledge that while capital monies were well spent, it was the revenue side proving a financial pressure on the educational department. “That’s because the purpose of Sprouts was based on a childcare sufficiency assessment which is a requirement the local authority carry out every three years to ensure parents have access to childcare provision. “That piece of work identified a shortcoming of supply in provision at early mornings, weekends and evenings which was not being provided at the time. On that basis Sprouts went forward. Cllr Wynn added: “In hindsight maybe Sprouts business plan could have been better challenged at time. Maybe the assessment did mislead officers. 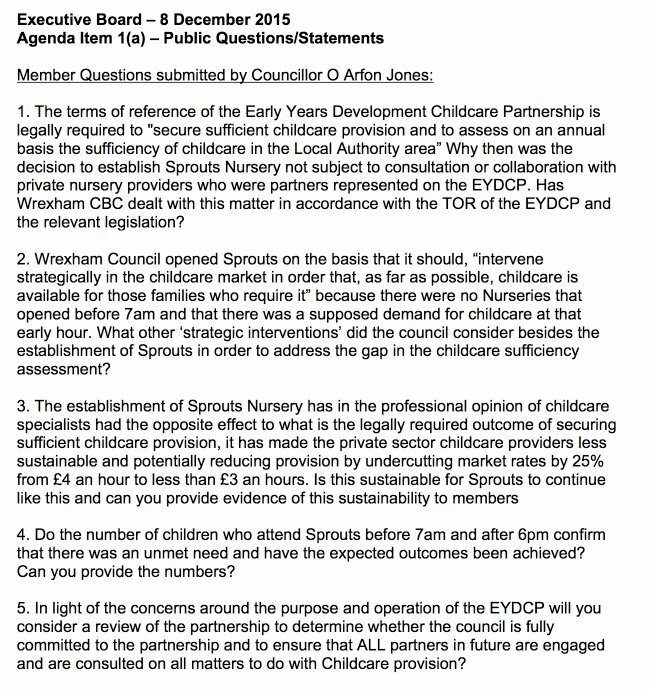 However Cllr Jones described Sprouts as an “expensive mistake” and that his “fundamental concern” is the expertise that could have prevented the nursery’s closure was ignored. Cllr Jones said: “Despite using public money to effectively undercut existing provision, it lost money in first and second year and only closed down after last year’s election. My understanding it was kept open to save blushing of certain councillors. If that’s the case it’s shameful. “We were willing to throw good money after bad into Sprouts, even after we knew it was losing thousands a month, had poor inspection report and wasn’t meeting its initial promises. He added: “The lessons from my perspective are don’t chase grants for the sake of it as they need revenue funding or they will fail. Don’t make decisions on need to fill empty building, make sure the business case is robust and listen to expert advice. We had plenty of expert advice in this field and it was ignored. Cllr Wynn hit back at the questions raised over a financial clawback on capital monies, accusing Cllr Jones of “political point scoring” which could see the council’s education department have “£155,000 less money on school programmes” if Welsh Government asked for the cash back. Cllr Dana Davies relayed a series of attempts from herself and former councillor Arfon Jones to debate Sprouts at scrutiny – noting that she had been sent to three different committees and told each time it fell within the remit of another. Cllr Davies said: “I am furious. As a corporate parent, there is no way I could bring those concerns to a scrutiny committee to discuss them and learn lessons then. “The governance structure is words on a piece of paper, it didn’t work. There are five scrutiny committees in this council and I tried three and couldn’t get the issues heard. The meeting was told that since the closure of Sprouts, the Wrexham Family Information Service had been relocated from Dean Road to the former nursery. Something, the committee was told, still fulfilled the initial VVP aims of providing a service and creating jobs in the town centre. Finance officer Mark Owen added that the Welsh Government was aware of how the family facility is operating and that there is “no plan for clawback of funding as current usage is consistent with principles of original funding bid”, also noting that claims over unanswered Freedom of Information requests did not match the data he had before him but did acknowledge there were ‘clearly lessons to learn as part of it’. It was also noted that while the overall “governance of VVP” was operating, Sprouts “probably didn’t receive the level of attention” needed as it was a smaller scale than the “massive multi-million pound projects”. Commenting on the initial business plan, Cllr Frank Hemmings queried where the figures came from for the service and why they didn’t materialise in the projected usage of Sprouts. A council officer explained that the figures were based on the ‘Childcare Sufficiency Assessment’ and that feedback at the time from parents was that childcare was required at times such as early in the morning or later in the evening. However it was acknowledged that the “sample was quite small”, which was taken as a representation that there was demand for the service. Despite the criticism of the Sprouts project, the meeting was told by a council officer that it had infact “over achieved the majority of targets” in the VVP element itself, with the issues coming later during the actual running of the service. Cllr Skelland looked to shift any blame to Welsh Government, ‘if there is a criticism of anyone it is Welsh Government’, being critical of the short window of time open to create and submit bids, with the implication poor plans could be a result of that. At times there appeared to be a divide over what the outcomes of the meeting should be, with Cllr Alun Jenkins stating that on the whole the VVP project had been successful. However Cllr Mark Pritchard, leader of Wrexham Council, offered a blunt message of the local authority being unable to subsidise a service when the private sector can deliver it. He added: “Was there a need for Sprouts? We were told the business case was solid and sound and would deliver what we wanted, that’s why it was taken forward. “That proved to be wrong decision as the market wasn’t there and we had to subsidise it. That’s why it closed. I believe the decision was taken for those reasons. Cllr Pritchard widened his point in the context of ongoing multi million pound cuts to the council’s budget, adding: “We should learn today that we cannot go out and get grants for facilities when we have no revenue to run them in the future”, after earlier defending the Executive Board’s decision to close Sprouts by saying “We are not in the business of subsidising services that do not wash their face”. – Noting the changes made to the Council’s Project Management Booklet, and get copies circulated. – More linking between the scrutiny process, with Chairs and co-Chairs being given more information, with topic request forms being used to progress any concerns. This will also include notes on the committee forward work programme, and via information reports. – Future projects will ensure all necessary consultation with stakeholders is undertaken. – Thanking Officers for their work, and also recognition of the successes of the other programmes under the VVP programme. Mini debate now on if the Committee will make recommendation basically saying the VVP programme was successful, aside from the Sprouts bit. Cllr Jenkins suggested it, with Cllr Skelland effectively seconding it. Other proposed Reccs also pass a vote- not unanimous. Meeting ends! Another proposed recommendation is that ‘future projects ensure all necessary consultation with stakeholders is undertaken’. Would have hoped in 2018 that was not a new suggestion…! Clr Davies makes recommendation that info given to Chair’s is lightly shared to committee, so if committees wish they can add it to their agendas to discuss more indepth. Officer explaining changes, appears lots of info on offer to scrutiny Chairs so onus is on the Chair’s and committees to do basically do their job! Are Cllrs challenging their Chairs to get and share info to consider and question? Cllr Pritchard bluntly says on business case of projects, “We cant go out get grants and open facilitates when we don’t have the revenue to run them in the future”. Cllr Davies asks what Wrexham Council are doing to ensure new projects “are on track, with the right people leading , and with with the right experience”. Council Leader says he has ‘every confidence’ structures are now right, and if not he expects Scrutiny to pick things up. Clr Wynn cites scale of Wrexham Council as an entity, says ‘we all make mistakes’, points out ‘Welsh Government back wrong horses’ too. Clr Paul Roberts notes just 9 VVP projects, asks how come 1 fell down. Reply given each project managed by ‘host department’. ‘It delivered, it did not fail’. ‘Ongoing operationally’ it seems was a different matter…but that was run differently. Clr Paul Roberts asks the Cmte to start forming their recommendations while he asks two questions, one about what the ‘Post Project Review’ entailed. Basic answer is – the report before this committee! Cllr Nigel Williams compares Sprouts to ‘real world’ enterprise talking about the £150k, “If this was a business set up by a member of public , they would not wait 3 years to ask for help, but they don’t have taxpayer to pick up the bill”. Appears process improved, so Chairs & co-Chairs of Scrutiny can (on request?) have ability to get info/look at programs. Cllr Davies happy with changes, explains “It felt as though there was a complete block”. Council Leader says was up to Scrutiny Cmtte to push / challenge more. Officer tells meeting infact “Sprouts over achieved the majority of targets”, and Welsh Gov are ‘satisfied’ with that. Lessons over ‘council governance aspects’ are being learned eg. given as project management handbook for Wrexham Council has been updated. Question over demand and consultation is answered with Officer saying in effect WCBC were “told by a sample ‘this is needed’ “, but “that should have been tested wider”. Appears small initial dataset was seen as a greater demand than reality. A few murmurs after Cllr Skelland point, Cllr Davies says Cllr Skellands ‘comments sounds like when we get it right it is a fluke’ , adding the track record of WCBC indicates confidence in grant application process, as ‘always had a good reputation’ in the area. Cllr Skelland says Welsh Gov give ‘so little time to put schemes together’ adds ‘if there is a criticism of anyone it is Welsh Government’. Public gallery: “What? !” Cllr Skelland says putting a ‘sound plan forward’ in short time is tricky. Finance Officer also says after dialogue with Welsh Gov civil servants there are ‘no plans for clawback’ of the funding, as new current usage is ‘consistent with principles of initial funding bid’. Finance Officer replies to points raised, says had ‘more FOIs on this area’ than most others, about 15 , says all responded to. Notes a ‘degree of transparency’ on topic, but adds ‘clearly lessons to learn as part of it’. Mini barney nipped in the bud by the Chairman and Cllr Dana Davies who points out Scrutiny should be non-political after Clr Wynn says Cllr Jones questioning clawback could be a political ‘own goal’. Question on if Welsh Gov will clawback funding due to Sprouts closure, no definite answer from Cllr Wynn as he says hes ‘hopes’ WG will not, and says as far as he knows it is not the case. Implication from Clr Wynn that Clr Jones’ question could trigger clawback? Clr Jones goes on: “Despite using public money to undercut existing provision it lost money in the first year and second year, and closed after last years election.” Asks if kept open ‘to save blushes of certain councillors who pushed it through’, ‘If that is so, it is shameful’. Cllr Marc Jones says FOI’s were not responded to regarding Sprouts, claims the Executive Board ‘failed transparency test’, says former Cllr @ArfonJ ‘was blocked at every turn’ when questioning the project. Cllr Marc Jones, who raised topic request form 14 months ago kicks off the Qs, thanks Cllr Wynn for ‘honest’ assessment – noting Cllr Wynn was not in the job at the time. Says Sprouts ‘was a very expensive mistake’. Cllr Wynn says ‘hindsight it a wonderful thing’, while saying ‘perhaps the business plan could have been better challenged at the time’ for Sprouts. Says his department ‘will learn lessons going forwards’. Clr Wynn says Sprouts “revenue side was a financial pressure to education department” – £150k funding rather than £90k recently reported. Says WCBC “Not in the game of taking risks” and “risks were too high” – thus closure. Intriguing – it is not to do with growth bid but ‘savings’. Cllr Dana Davies obviously keen to get something on the agenda ASAP for a future meeting. No mention of what and why, or if will even happen. That was clear as mud to the public! Appears there was confidential meeting yesterday about something that may or may not be in the pipeline in budget process. Request from Scrutiny Ctte to put something on agenda as early as possible, if Lead Member working on it, so Scrutiny can look. Cllrs being careful on words. Here at the Guildhall for a Scrutiny meeting that will be looking at what lessons there are over Sprouts – this meeting has been long awaited by some, who are hoping to ask and get answers to their questions on what went wrong.